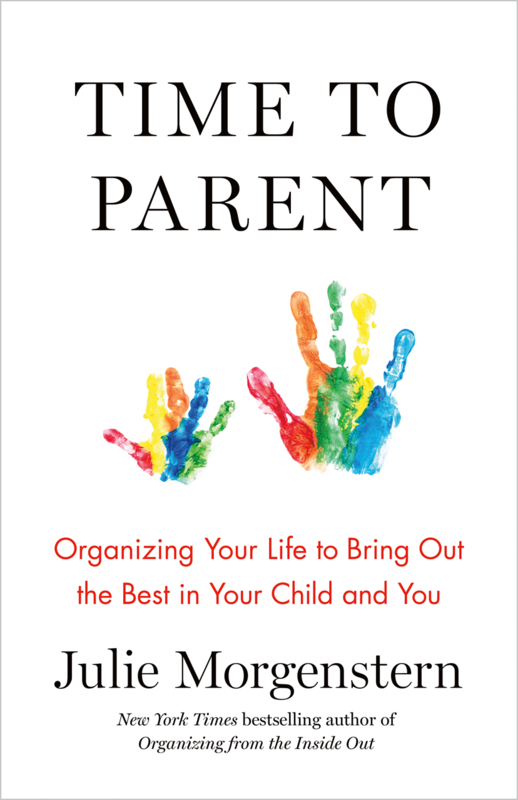 Announcing the Washington DC Book Launch for Julie Morgenstern’s upcoming book, Time to Parent: Organizing Your Life to Bring Out the Best in Your Child and You. Join fellow “Inside Out” fans to hear Julie discuss the most challenging time management issue in the age of technology, keeping your family organized so you can enjoy time with your loved ones. "I have a big history of book events in DC, which has included speaking at the National Book Festival with the launch of my last book SHED Your Stuff, Change Your Life. It was a huge turnout, and it made me feel very connected to readers in Washington DC. This time around, having the chance to speak with families and to help them better organize their lives so that they can have quality time with their kids and for themselves is something I am very much looking forward to sharing." Register for the first-ever public event sponsored by the Washington DC chapter of the National Association of Productivity & Organizing Professionals (NAPO). 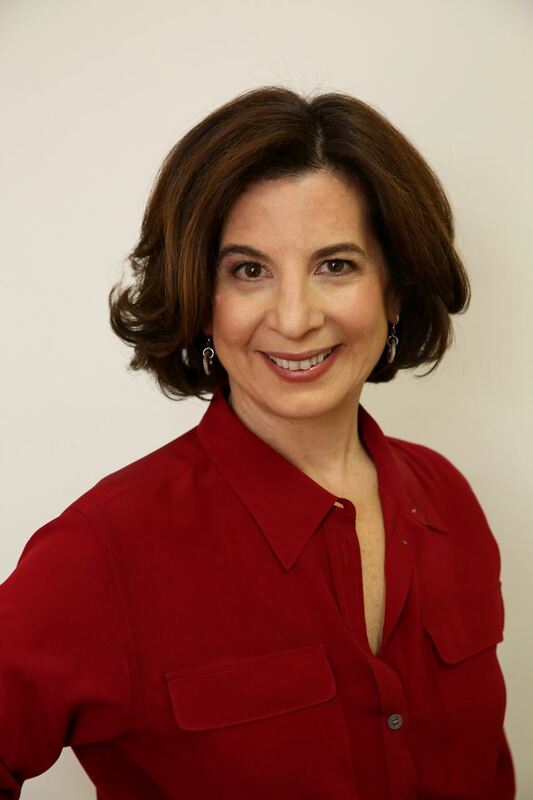 Both the public and productivity professionals are invited to attend the official book launch and presentation of Julie Morgenstern’s new book Time to Parent. All book launch attendees will receive a copy of Julie’s new book and the opportunity to take part in a book signing reception. 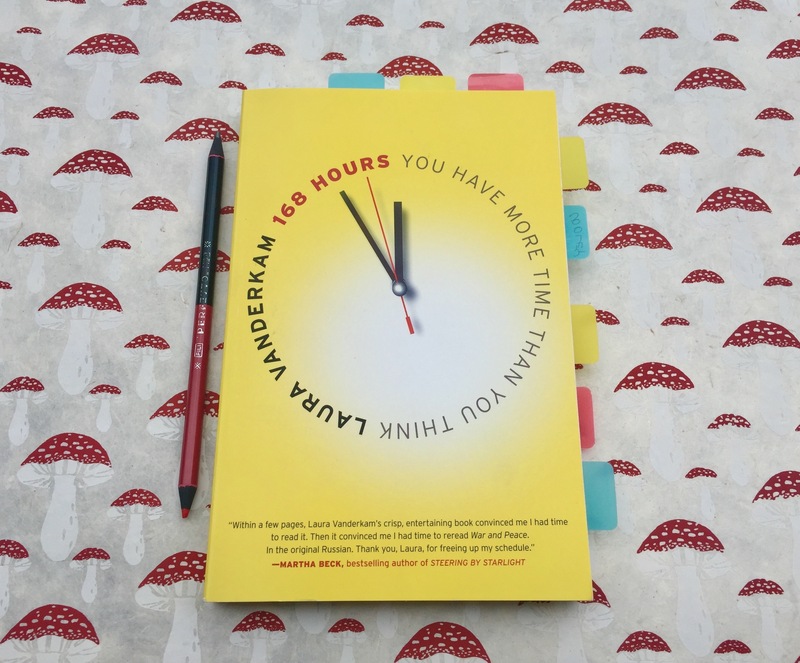 The Book Launch begins with a presentation by Julie Morgenstern, focusing on her latest time management and productivity lessons. Ask Julie your burning productivity questions in a question and answer (Q&A) period. Afterward, meet Julie and get your copy of her new book signed, then mix and mingle with Professional Organizers and Productivity Experts at the book signing reception. The event will be held in beautiful Founder’s Hall on the campus of George Mason University in Arlington, Virginia, with easy access to Metro and affordable parking at the event location. Make a day of it by visiting one of the wonderful restaurants and/or stay at a hotel close by. Please contact productivity@dcorganizers.org with questions or for more information. Do You Really Need That New Piece of Clothing? By Kaveri Marathe, Founder and CEO of Texiles, a clothing recycling startup based in Washington, DC. Clothing waste has become a serious environmental problem for the United States. Americans throw out 80 pounds of clothing per person every year on average. All this adds up to 13 million tons per year, or 6% of landfill space. Yet, surprisingly, most of the textile material that ends up in the trash, in fact, can be recycled. Old clothing that is no longer considered wearable, such as garments with stains or holes, can be shredded down and converted into useful inputs for the housing and automotive industries, like insulation, carpet underlay, protective padding, and stuffing for cushions. Most consumers, however, feel they lack an alternative to throwing out garments in poor condition, because they feel uncomfortable donating these items to secondhand clothing charities. 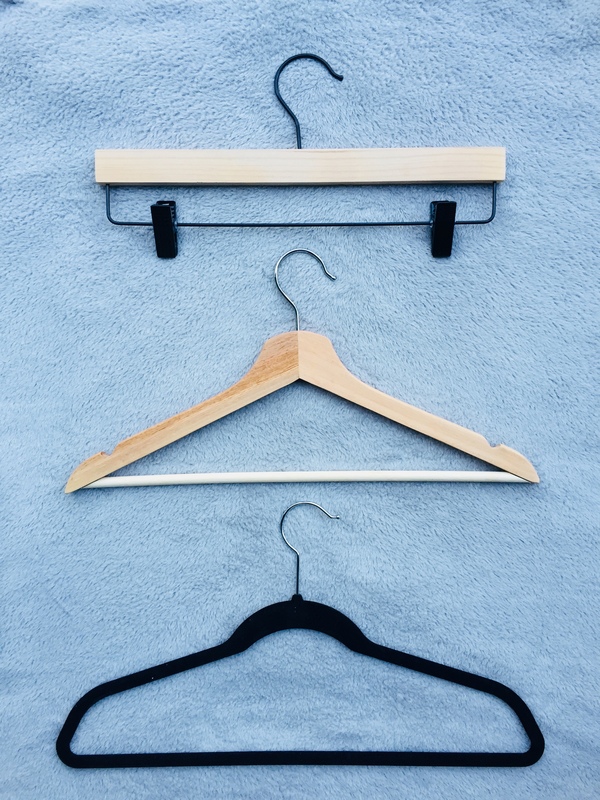 Consumers should know that they can, and should, include such items with their wearable clothing donations because most clothing charities work with a recycling partner that will responsibly dispose of worn-out garments. Ultimately, to tackle the root of our problem of trashing clothing, we will have to address Americans’ rising consumption of clothing. Today we purchase 400% more clothing than we did just 20 years ago, largely due to the rise of “fast fashion” – the trendy, yet cheap clothing that has flooded retail stores, like H&M, Zara and the Gap, in recent years. Curbing clothing waste will only subside when we return to a more quality-over-quantity-based shopping ethic. Author Kaveri Marathe is the Founder and CEO of Texiles, a clothing recycling startup based in Washington, DC. She is originally from Florida but moved to DC in 2011 to pursue her Master's in International Relations at Georgetown University where she focused on energy and environmental policy. Following that, she spent 2 years in Oslo, Norway working as a sustainability consultant and returned to DC in 2016 to launch her own business. For more information, you can visit her website at www.texiles.com. By C.Lee Cawley, Certified Professional Organizer and Founder of Simplify You, Inc.
Hangers! Something we use every day but don’t think much about. It is worth investing in the right ones for your unique clothing needs. STYLE: Always buy hangers that have a bottom cross bar also known as a “suit hanger." This enables you to easily hang a scarf with a blouse that matches it. Or, you can fold a pair of pants over the cross bar. The crossbar also makes the hanger stronger and more durable. FLOCKED: My favorites are the thin flocked hangers also known as “huggable." They are widely available but Costco wins for bargain prices: 35 for $9.99 (45.5 cm wide). PLASTIC: The black plastic classic tubular hanger from the Container Store is the best. At 41 cm wide the style will always be consistent and the quality is excellent. Buy them by the case for a price of 27 cents each. WIRE: “NO wire hangers ever!” Actually, I am not as militant as Joan Crawford and will allow blouses and shirts that are back from the cleaners to stay on wire (that way you know they have been cleaned). But jackets must be switched ASAP! That bit of cardboard shaped like a wedge will not support a shoulder for very long. BOTTOMS: The Holding Hanger, created in Europe will soon be available in the US. This hanger uniquely holds garments from INSIDE the waistband. MEN: Classic wooden hangers with a shoulder width of at least 1” are essential for hanging your suit jackets so that they retain their shape. SLENDER SHOULDERS: Petite women will love the Okla Hangers from Container Store. These hangers are only 42 centimeters across and won’t stretch or pull the fabric the way a wider hanger can. They are not cheap at 3 for $3.99, but your expensive sweaters and work wear will thank you! BACKWARD: When re-doing your closet or when your seasonal switch is over there is one last step! Go through and put all the hangers on the rail “backward” so that the tip is facing out. As you wear and wash your clothes then return garments “normally” to the rail. This simple cost-free idea makes it effortless for you to see what you have REALLY been wearing at the end of a season. If your New Year’s Resolution is to “Get Organized,” I applaud you and support you! To Be in Control? – Do you sometimes feel a loss of control over your office environment where you are in a reactive mode instead of a proactive mode? Do you yearn for a greater sense of control where you know where everything is when you need it? Do you crave order, but you’re working in chaos? To Save Money? – How much did you rack up in finance charge and late fees this year? Are you trying to tighten your budget? Do you find yourself buying duplicate items because you can’t find the original one? Understanding the driver behind your goal will help you get through the tough spots and provide that extra boost of motivation to see the goal through to the end! We are the Washington DC Metro chapter of the National Association of Productivity and Organizing Professionals (NAPO) comprising more than 60 members located throughout Maryland, Virginia and Washington DC. We are fortunate to be a part of this talented group of professionals with many different specialties, each of us coming from unique professional backgrounds that lead us to this meaningful profession; all of us dedicated to helping others get organized to achieve a greater sense of well-being. It’s true, we get what we give. And that’s been apparent to us all year long, with the gifts we receive through shared stories, shared problem-solving, and never-ending support of each other. As we reflect on 2017, we pondered on the infinite march of natural disasters that occurred throughout the past year (the continual onslaught of catastrophic hurricanes along the south and east coasts and relentless devastating fires up and down the west coast). These sudden scenarios force you to contemplate long and hard about what’s important. -- If you had only moments to collect your most valuable items (think photos, important documents, family heirlooms, or anything else that’s significant to you), would you know where to find them? This is where we come in! 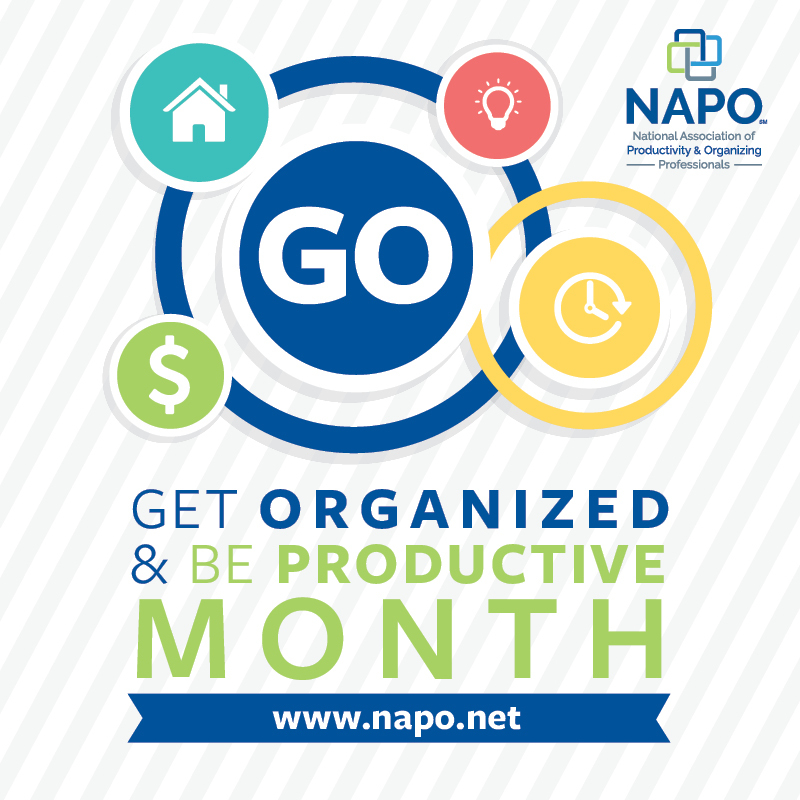 Which brings us to… January is Get Organized (GO) Month! For many of us whose family and friends were impacted by the devastation and destruction, it’s a constant reminder that there is no better time than now to get organized and liberate yourself of unnecessary stuff, so you too, can be prepared in the event of an emergency. For certain, it brings a sense of calm when you know exactly where your most treasured and important items are, at home and at work. With the fresh slate that January brings and the cold of winter keeping us indoors, we’re here to share our top tips on getting and staying organized, share ways to increase productivity (you have more time than you think!) and connect you with the proper resources available to you to achieve a more calm and peaceful life. Here’s to an organized 2018!